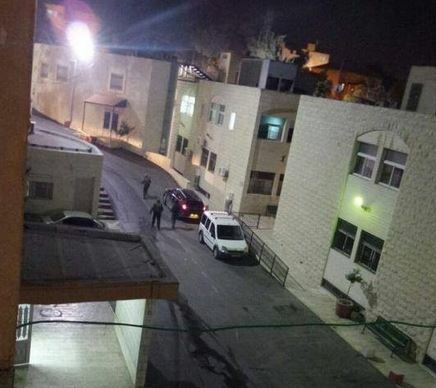 Dozens of Israeli soldiers invaded, on Saturday evening, the al-Makassed Hospital in the at-Tour town, in occupied East Jerusalem, and kidnapped one Palestinian after assaulting him. 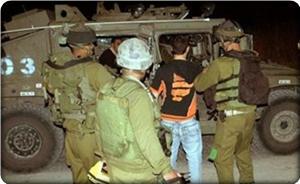 Soldiers also kidnapped three Palestinians, including a child, in Jerusalem. Eyewitnesses said the soldiers searched the hospital and its yards, before invading the Urgent Care Unit, and kidnapped a young man after beating him. Hospital Administration said the soldiers fired dozens of gas bombs into the hospital, over the last two days, and even sprayed it with waste-water mixed with chemicals. It denounced the ongoing assaults, and said invading hospitals is an act that violates International Humanitarian Law, and called on the Red Cross and representatives of western countries to intervene and stop the escalating Israeli violations. The soldiers also fired dozens of gas bombs into the streets of at-Tour, and even into a number of stores and homes, and kidnapped a child identified as Omar Abu al-Hawa, 14. Clashes also continued in the Shu’fat refugee camp, Jabal al-Mokabber, and various Palestinian neighborhoods and towns in occupied East Jerusalem while local youths managed to burn a military watchtower at the near the camp. On Saturday evening, soldiers kidnapped two young men, identified as Hamza al-Joulani and his brother Bilal, in Silwan town, in occupied Jerusalem. In other news, Israeli sources said three settlers were injured when Palestinian protesters hurled stones at their car, near the northern West Bank city of Nablus. An Israeli teen injured in Wednesday's vehicular terror attack in Jerusalem succumbed to his wounds Friday morning. 17-year-old yeshiva student Shalom Baadani from Jerusalem, the grandson of a senior Shas religious figure, lay in critical condition in the Hadassah Medical Center in Jerusalem's Ein Kerem since Wednesday with his identity unknown. Baadani arrived at Haddasah after being wounded in the vehicular terror attack on Wednesday afternoon. Rescue personnel used a cellphone found at the scene of the attack to identify the patient, comparing images on the phone with the victim. Police then found his parents, who were summoned to the hospital and confirmed his identity. His death brings the death toll of the terror attack to two - or three, if you include the attack's perpetrator Ibrahim Al-Akari, 38, who was killed while still rampaging in Jerusalem by an officer and four soldiers. Al-Akari, a Palestinian from East Jerusalem, rammed his car into pedestrians near one of Jerusalem's Light Rail stations. Hamas claimed responsibility for the attack, which saw Akari plow down a group of Border Gaurd police officers, killing Chief inspector Jadan Assad, a Druze officer from Beit Jann, and then continue to the station, hitting additional pedestrians, only to continue his attack on foot with a metal rod. Apparently, Baadani was riding a bicycle when he was hit by the terrorist. His parents never worried, because they knew he was supposed to return home late at night. Baadani is the grandson of a member of the Shas Party's Council of Torah Sages, Rabbi Shimon Baadani. Among the hospital visitors was MK Eli Yishai. Violence continues Nearly daily stone-throwing protests have erupted in East Jerusalem neighborhoods, and at a flashpoint holy site in Jerusalem housing Islam's third-holiest site, and which Jews revere as the place where biblical Jewish temples once stood. Israeli police deployed extra forces on Friday to try and prevent further violence, also limiting access to worshippers by permitting only Muslim men older than 35 to enter the compound of the al-Aqsa mosque. Palestinians accuse Israel of trying to change the delicate status quo at the site, citing visits by right-wing Israelis seeking prayer rights there. 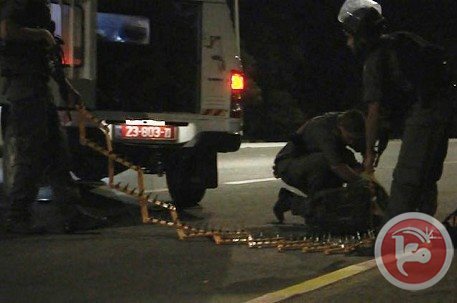 The Palestinian man suspected of having run over three Israeli soldiers, Wednesday evening, has reportedly turned himself in to security forces. Earlier, Israeli raids occurred across the southern West Bank, in an attempt to find the man, identified as one Hammam Masalma. According to Ma'an's reports, four of Masalma's relatives were detained from the southern West Bank town of Beit Awwa, early Thursday, after Israeli forces raided the area and found no sign of Hammam. Palestinian security sources said that Israeli troops erected several military checkpoints around Beit Awwa, to the west of Hebron, before ransacking the home of Mr. Masalma, who they believed deliberately attacked the soldiers. Masalma, however, was not at home at the time of the raid and Israeli troops decided to detain relatives Muhammad Jamal Shalash Masalma, Subhi Shalash Masalma, Issa Khalil Masalma and Ismail Subhi Masalma, instead. The Israeli soldiers also ransacked and inspected homes of Jamil Badawi Masalma and Abdul-Qadir Ismail Masalma. Israeli police sources say that they managed to identify the truck driver from the vehicle's registration data. Many other homes in the region were ransacked and inspected. According to Ma'an, Wednesday's hit-and-run incident on the main Bethlehem-Hebron road was the third such vehicular attack on Israeli soldiers and civilians in recent weeks, although the previous two took place in Jerusalem. Palestinians, however, have reportedly decried the double standards surrounding the events, with note to the fact that Israeli settlers in the occupied West Bank regularly run over locals -- including many children -- but are never accused of terrorism as a result. The case of 5-year-old Einas Khalil is only the latest in a series of Israeli settler hit-and-runs on major Palestinian roads, but the story failed to garner widespread attention in Israeli and Western media. The Israeli army said that three soldiers were injured, on Wednesday at night, in what seems to be “a hit-and-run attack,” near the al-‘Arroub refugee camp, north of the southern West Bank city of Hebron. The army said one of the soldiers suffered a serious injury, and that the accident was a deliberate attack against the soldiers. Soldiers initiated a search campaign in an attempt to locate the driver. The army said the Palestinian car sped towards the Al-‘Arroub refugee camp, and that the soldiers installed a number of roadblocks in the area, closed the main road between Beit Ummar and Halhoul towns, and initiated a search campaign. The soldiers stopped and searched hundreds of cars and investigated the ID cards of the passenger. The area where the incident took place witnesses frequent Israeli military invasions and clashes between the invading soldiers and local Palestinian youths. Hours before the Hebron incident, a Palestinian driver rammed several Israelis at a light-rail stop in occupied Jerusalem killing a police officer and wounding 14 Israelis. The recent escalating violence, tension and clashes in occupied Jerusalem come following dangerously increasing invasions, and provocative tours, by Israeli extremists invading the Al-Aqsa Mosque compound, while local Muslim worshipers are largely denied access to the mosque due to these invasions, while the army has detained many worshipers, including mosque guards, women and elderly. The police and army also kidnapped dozens of Palestinians in the yards of the mosque, and even fired gas bombs and concussion grenades into the mosque itself causing various injuries. Also on Wednesday, dozens of Palestinians suffered the effects of tear gas inhalation, and many were injured by stun grenades and rubber-coated metal bullets, during clashes that took place in the Al-Aqsa compound after scores of soldiers stormed it. At least nine of the wounded Palestinians were moved to the Al-Maqassed Islamic Hospital in Jerusalem; two of the wounded suffered injuries in their eyes, while 32 were injured by shrapnel, or due to the effects of tear gas inhalation. In what has been confirmed as a "deliberate attack," Israeli sources said an Israeli man was killed, and several others injured, when a Palestinian driver rammed them with his car in Sheikh Jarrah, in occupied East Jerusalem. The Palestinian man was later shot and killed by the Israeli Border Police. Initial reports indicate that the driver first rammed a number of Israeli security officers while waiting at a crosswalk, then continued to the train stations and rammed a number of cars in the street. pedestrians with his car, killing one and seriously wounding two others, while two more Israelis suffered moderate injuries. He then hit several cars before stopping and exiting the vehicle reportedly carrying an iron bar before border police officers shot him dead. The Arabs48 news website said the Palestinian driver has been identified as Ibrahim al-‘Akari, 38, from the Shu’fat refugee camp. 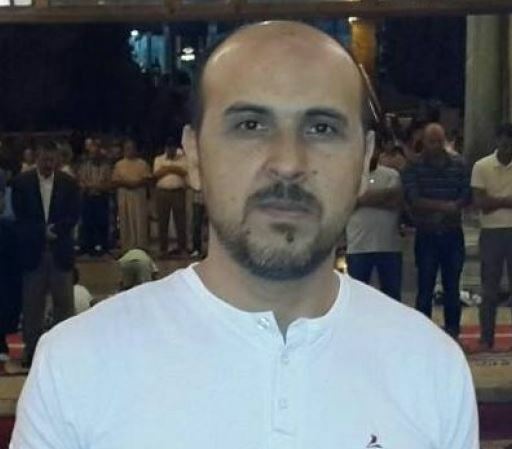 He is the brother of former political prisoners Mousa al-‘Akari who was exiled to Turkey as part of the Shalit Prisoner Swap deal, in October 18. 2011. The brother, Mousa, is believed to have been a member of a Hamas group that killed an Israeli soldier after kidnapping him on December 13 1992. He was sentenced to three life terms. The Arabs48 said the “Internal Israeli Security Service” insists that al-‘Akari should be buried at the “Numbers Graveyard” where many Palestinian and Arab fighters are buried in numbered, nameless, graves. The Hamas movement officially claimed responsibility for the attack, and said Ibrahim al-Akari is one of its members, and that he carried out the attack in retaliation to Israel’s ongoing violations against the Palestinian people, and the constant attacks targeting the Al-Aqsa Mosque, and Jerusalem. Hamas official Fawzi Barhoum said in a statement that the operation is “a natural response to the Israeli crimes, constant abuse and violations targeting Al-Aqsa and holy sites, in addition to the ongoing displacement of Palestinians from their occupied city, Jerusalem. Earlier on Wednesday, the Israeli army briefly closed the Al-Aqsa Mosque compound confrontations with dozens of Palestinians who clashed with Israeli extremists, and soldiers, invading the Mosque compound. The Israeli occupation forces (IOF) on Sunday morning kidnapped four Palestinian citizens from their homes during a campaign in al-Khalil city. Local sources told the Palestinian information center (PIC) that Israeli troops stormed homes belonging to the families of Dofash, Qawasmeh and Juneid in different areas of al-Khalil and kidnaped Suhaib Juneid. To the north of the city, scores of Israeli soldiers aboard armored vehicles invaded Beit Ummar town amid intensive gunfire and took three Palestinians prisoners. The IOF did not state the reasons for its detention of the four citizens. In an earlier incident, Palestinian young men attacked with a Molotov cocktail an Israeli watchtower on the main road between Beit Awwa, west of al-Khalil, and some nearby villages. Eyewitnesses told the PIC that the IOF blocked the main road and the entrance to Beit Awwa, and intensified its presence there in the wake of the firebomb attack. The Israeli occupation forces (IOF) at dawn Sunday stormed Jalama and Arraba villages, north of Jenin, and clashed with young men. Local sources said IOF soldiers were deployed on the street between the villages of Arraba and Jalama, north of Jenin, and established a roadblock there. The sources added that the troops at the roadblock interrogated 27-year-old Hisham Jarrar after intercepting his car, and handed him a summons for interrogation from the intelligence in Salem military post. Afterwards, violent clashes broke out near the barrier when a group of angry young men from the villages hurled stones at the invading troops, who responded by firing tear gas grenades and rubber bullets. 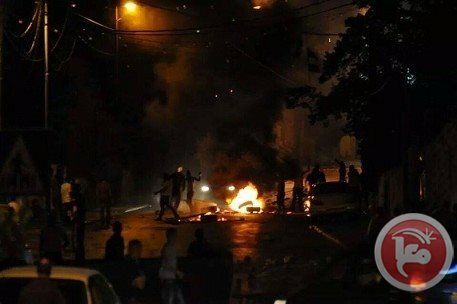 In another incident, scores of Israeli soldiers raided Husan village, west of Bethlehem, after a Jewish settler was attacked with a Molotov cocktail as he was driving his car into the village. Eyewitnesses told the Palestinian information center (PIC) that the IOF stormed the village after midnight and ransacked a house belonging to Hamamrah family, claiming that they were looking for a video recording from the surveillance cameras of a commercial store that could lead to the one who threw the Molotov cocktail at the settler. 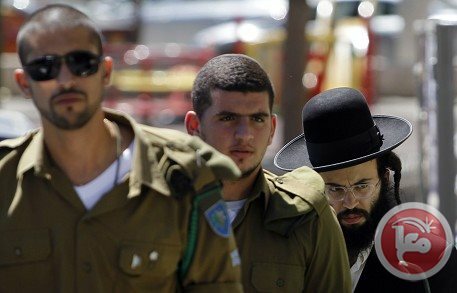 The Israeli media had said on Saturday that a settler was seriously injured when a Palestinian young man threw a Molotov cocktail directly into his car and burned it entirely. The head of Beitar settlement near the village issued a verdict ordering all settlers to never enter the village and warning of a severe penalty for those who disobey the orders. Prior to Israel's war on Gaza, Husan village was one of the most important marketplace for Beitar settlers who used to buy their needs from the village at cheap prices, but now most of them refrained from entering it for fear of reprisal. A gunman shot and injured an Israeli soldier in Jerusalem on Monday, Israeli media and police said. The Israeli news site Ynet said initial reports suggested that a man on a motorcycle opened fire at a soldier near Hebrew University. The soldier, a man in his 20s, was seriously wounded and taken to a local hospital for treatment, the Ynet report said. Israeli police spokesman Micky Rosenfeld tweeted "police respond to shooting incident near Wadi Joz area in Jerusalem. One man injured moderately/seriously. Police looking into background." "One man injured taken to hospital for treatment. Police searching for suspect that fled the scene," Rosenfeld said in a second tweet. Later, he added: "Police heighten security in Jerusalem after 2 terrorist attacks today. Units mobilized in different areas & search continuing for terrorist." Earlier Monday, Israeli police shot and killed a Palestinian man who rammed an excavator into a bus in East Jerusalem, knocking the bus on its side and running another man over in an apparent attack. Palestinian fighters opened fire on an Israeli settlement near Nablus early Thursday, in the latest in a string of armed attacks on Israeli settlements and checkpoints across the West Bank in the last two weeks. Palestinian security sources told Ma'an that armed assailants opened fire on Shavei Shomron, located at a major junction on the main road leading north from Nablus. Israeli forces shot back live fire, with no injuries reported on either side. An Israeli military spokeswoman did not immediately return calls seeking comment. In the last two weeks, armed attacks on Israeli military sites and settlements in the West Bank have increased amid the Israeli assault on Gaza, which has killed nearly 1,400 Palestinians. 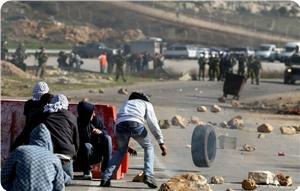 On Tuesday, Palestinians opened fire and injured an Israeli soldier in Qublan, also near Nablus. About 550,000 Israelis live in settlements across the West Bank and East Jerusalem on lands largely confiscated from local Palestinian communities. Under international law, all settlements in occupied territory are illegal. An Israeli soldier was injured early Wednesday in a Nablus-area village when a Palestinian man opened fire at several soldiers, security sources said. Palestinian security sources told Ma'an that a man had shot at Israeli soldiers as they were raiding the village of Qublan, injuring one of them. Israeli reinforcements launched a search for the shooter shortly afterward. An Israeli army spokeswoman told Ma'an she was not immediately familiar with the incident. Last Thursday near the Qalandia checkpoint between Jerusalem and Ramallah, during the largest protest the West Bank has seen since the Second Intifada, the Israeli army said Palestinians had opened fired at soldiers from the crowd. Eyewitnesses said the shots led to a gun battle between militants and soldiers which lasted about 20 minutes. Fatah's military wing, the al-Aqsa Brigades, later took responsibility for an attack on the checkpoint the next day. Tensions in the West Bank have soared as Palestinians take to the streets for nightly protests against Israel's ongoing offensive on the Gaza Strip. Israel has killed at least 12 Palestinians in protests the last three weeks, and injured hundreds. The military wing of the Popular Resistance Committees al-Nasser Salah al-Din Brigades said on Saturday that its fighters shot and killed an Israeli soldier near Nablus in the northern West Bank. In a statement released from Gaza, the group said that fighters with the group opened fire at an Israeli military jeep "from a close distance at the Itamar settlement east of Nablus" at around 1:10 a.m.
"Our fighters confirmed that they killed an Israeli soldier in the jeep before they withdrew unharmed," the statement added. The group warned that military operations would continue in the West Bank in response to the ongoing Israeli aggression against the Palestinian people. Also on Saturday morning, militants affiliated with the Al-Aqsa Martyrs' Brigade claimed responsibility for opening fire on Qalandia checkpoint and injuring Israeli soldiers during a gun battle there. Tensions have been high in the West Bank as tens of thousands have protested the Israeli assault on Gaza that has killed more than 940 Gazans in the last 18 days. Israeli forces have killed 12 Palestinians in protests in the last two weeks, including nine in a twenty-four hour period ending early Saturday. Palestinian youths set fire to two Israeli military vehicles during violent clashes that broke out in southern Dura town in al-Khalil at dawn Wednesday. Eyewitnesses told the PIC reporter that Palestinians threw Molotov Cocktails towards Israeli jeeps while passing through Kharssa junction after the outbreak of violent clashes in the area. They said that two jeeps were burned while 10 other military vehicles stormed Tabka and Kharssa towns in al-Khalil. The sources added that several injuries were reported among Palestinian youths during the clashes that erupted in Dura town. 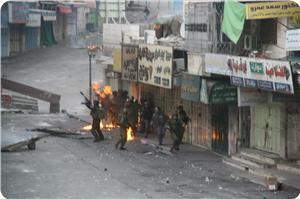 Meanwhile, Israeli forces came under fire at the entrance to Aroub refugee camp in al-Khalil. In response, the troops entered the camp amidst indiscriminate shooting at the inhabitants. 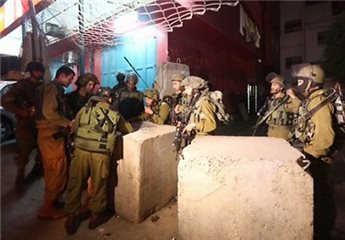 Local sources said that IOF soldiers stormed and searched a number of neighborhoods in the camp looking for the shooters, which led to the outbreak of clashes. 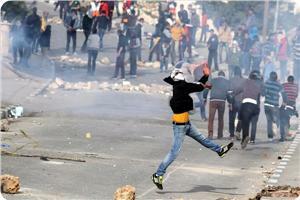 At least 6 youths were injured by rubber and live bullets during the clashes. Heavy tear gas bombs were deliberately fired towards Palestinian homes, causing breathing problems among the residents. In al-Khalil, Israeli forces stormed at dawn Wednesday Ahmad Qawasmi’s home and blew up a water well belonging to the family. On the other hand, PA security forces suppressed a solidarity march organized by Hamas Movement on Tuesday night in support of Palestinian resistance. Dr. Amani Hijazi, head of the Palestine Center for Prisoner Studies, confirmed that PA security forces brutally attacked the participants including women and fired tear gas bombs and rubber and live bullets at them, adding that she was among those beaten. Dozens suffered different injuries during the attack while others were arrested, she added. Angry Palestinian youths stoned Sunday morning Israeli settlers’ cars east of al-Khalil, while clashes were reported in nearby Fawar refugee camp. Local sources said that Palestinian youths threw stones at Israeli settlers’ cars passing-by the main street east of al-Khalil in response to Israeli bloody massacres in Gaza. No injuries were reported among the settlers. 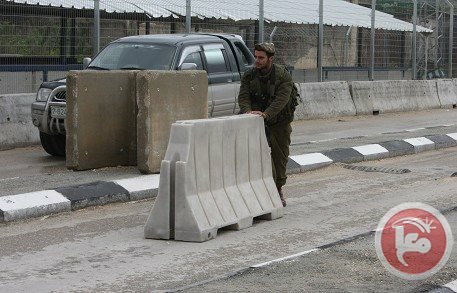 On the other hand, Israeli occupation forces closed the main entrance to Fawar refugee camp preventing Palestinians’ vehicles in, which led to the outbreak of violent clashes between Palestinian citizens and Israeli soldiers who set up a number of checkpoints at the entrance to the camp. Similar clashes broke out last night between hundreds of youths and IOF soldiers at Halhul Bridge, northern al-Khalil, and the neighboring Aroub refugee camp. Local sources confirmed that Palestinians threw stones, empty bottles, and Molotov Cocktails towards Israeli soldiers during the clashes. They also threw fireworks at the Israeli military watchtower set up near Halhul Bridge. For their part, IOF troops heavily fired tear gas and sound bombs in addition to rubber and live bullets. Several injuries were reported among Palestinian protesters. Meanwhile, dozens of IOF soldiers stormed Palestinian homes in Aroub refugee camp triggering clashes with the inhabitants.